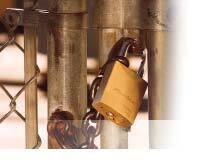 Master Lock provides the largest range of tight-tolerance cylinders and keys that vastly eliminate unwanted key interchange. This will better ensure that one employee's key will not be able to inadvertently open a second lock. Master Lock offers key control services, charted and reserved systems all of which assure that your company's padlocking system maintains the utmost in key integrity, even as you reorder padlocks year-after-year. This means that additional padlocks ordered can all be specified to operate by distinct keys, if that is your requirement. All cylinders have limits to the number of change keys that can be provided. Be aware that whenever KD padlocks are supplied from open stock, the possibility exists that two or more locks provided will have the same operating key. This possibility of overlap increases as additional non-charted (see Charting Service) stock orders are received. It is important to know the key change limits of the padlocks you are considering for your security system. If the supplier does not, or can not, provide this information, the integrity of your keying system may be suspect. Each lock is opened by its own unique key that does not open any other lock in the set. 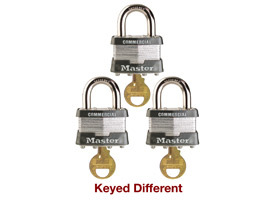 Keyed Different is the standard keying default on Master Lock and American Lock padlocks. In a Master Keyed system, a master key opens all the locks in the system although each lock also has its own unique key. This permits organizing master key systems along departmental or other functional lines to allow supervisory or emergency access. The cylinder in rekeyable padlocks can be removed in order to (a) change the pinning or (b) replace the original cylinder with a new one, restoring security quickly and economically. This is ideal for situations where keys are lost or stolen. Products with this option can be identified by "rekeyable" in the item description. 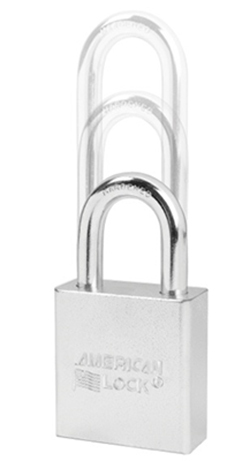 Rekeyable padlocks are available Keyed Different, Keyed Alike, or Master Keyed. 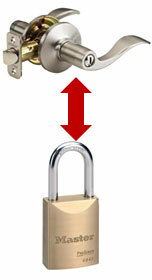 Interchangeable core padlocks and door locks don't require disassembly in order to change the cylinder. The figure-8 interchangeable cores (IC) can be removed and replaced with a single control key. The Master Lock assortment of cylinders includes 16 distinct keyways to match existing profiles from Best®, Falcon®, and others. Cylinders, ProSeries® padlocks - Solid Steel, Solid Brass, Solid Aluminum, Weather Tough® and High Security Shrouded locks, with cylinders and mortise or rim cylinders for door applications are all available. 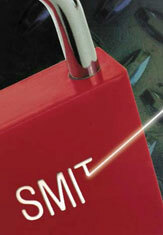 The same key that opens your security doors can now operate your security padlocks! The Master Lock assortment of Door Key Compatible Padlocks means that the same key can open all your facility's padlocks and door locks as well. 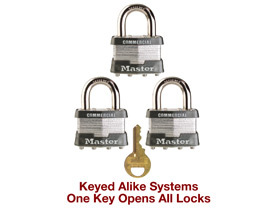 Most popular door keyways can be matched to a complete line of Master Lock and American Lock padlocks. 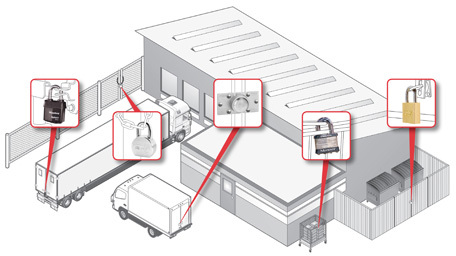 The result is greater facility convenience and key control, plus the full strength of Master Lock security. Master Lock offers the service of designing either a new or adding to an existing Master Key System for your organization. 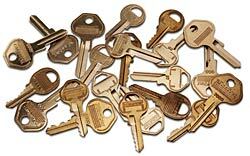 In a Master Key System, a Master Key opens all the locks in the system although each lock has its own unique key. In order to maximize the scope and flexibility of a new system, please evaluate your current and future organizational needs. 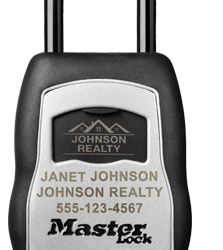 Learn more about how to design the proper Master Key System for your needs. 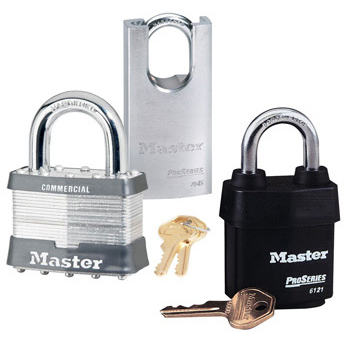 Master Lock and American Lock padlocks use a variety of keys and keyways. Keys are available both cut and blank. A diagram of the keys and keyways is available to identify the match to your padlock. 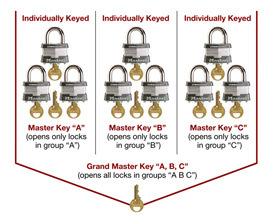 Download the Keys & Keyways Chart from the Master Lock Technical Manual. The bitting (cut depth) for Master Lock and American Lock keys varies according to the keyway. The bitting specifications chart provides an accurate listing of cut depths by keyway. Download the Bitting Specifications chart from the Master Lock Technical Manual. For companies wanting the confidence that the keys to their business cannot be copied, the patented Edge® Key Control system provides complete key control, eliminating the risk of unauthorized key duplication. The Edge® system is available across the broad line of Master Lock® and American Lock® padlocks. An affordable key control solution, available for about US $10 additional per lock, Edge® provides total control & protection while offering a convenient single key system. NEW! Laser Engraved Lock Boxes. Available on the 5400LZ and 5422LZ Engraved Lock Boxes, the new laser engraving service offers customizability and advanced branding options, giving companies a simple way to promote their business and provide contact information anytime, anywhere. Laser Engraving is available on most Master Lock and American Lock aluminum, brass, stainless steel and ProSeries® padlocks. Engraving options include logos and characters (numbers, letters and symbols) for safety lockout purposes, employee/locker identification or company or institutional/school branding. Hard stamping is also available. Master Lock and American Lock offers a wide range of shackle options including shackles in extra lengths and various materials, including hardened boron alloy, brass and stainless steel. Shackle accessories are available as well including shackle collars, and chain attachments.